Jenay is one of Tahoe's most recognized guides in the practice of Yoga. She has been voted Best of Tahoe, honored with the Tahoe Blue Ribbon Experience Award, spoken at the Symposium for Chinese Medicine & Yoga, is an active Tahoe Chamber Ambassador, member of the Tahoe Regional Young Professionals and a host for Entrepreneurs Assembly. As owner and director of Lake Tahoe Yoga she has chosen to consistently support local organizations through donations of goods, services and time. She spends most of her time volunteering for TAMBA and offering free practices at local organizations. She is a Tahoe Chamber Member and Ambassador as well as a member of the Tahoe Regional Young Professionals. ​Jenay is truly an artist in the field of Yoga. She believes that we all must understand ourselves before we can discover our individual Self. Through personal experience and continued study she has learned to teach Yoga in a way that combines physical therapy and development of mindfulness. Physical practice helped her to open the door to inner understanding. Svadhyaya; self study that has been the true light upon her path. Through the study of books and ancient texts, deep concentration, and recognition of the mirrors provided by those with whom she practices and engages, she has come to see the light that shines upon her path. Her Yoga teaching career began in 2005. Her training includes influences from B.K.S. Iyengar, Pattabhi Jois, Rod Stryker, Amy Pearce-Hayden, Gabriel Halpern and Elena Brower. She specializes in teaching in-studio practices with unique sequences that challenge practitioners to focus on the present moment and individualized private sessions that address that which lies beneath the physical. Having taught from coast to coast and internationally, Jenay is a skilled guide of the practice. She is talented in expressing instruction and philosophy so that it is easy to understand. Her experiences include teaching children, school teachers, adults, seniors and children with disabilities and/or recovering from trauma. She draws upon her training in psychology & counseling in order to connect with practitioners and offer a practice that encourages openness and change. Jenay has also taught Yoga in some unique locations including the Moonlight Bunny Ranch and on stage at Harvey's Outdoor Theater. She is also the official Yoga teacher for the UNR Football team. Go Wolf Pack! Jenay has shared the practice with groups from Google, Nike, Adidas, and more. She is also honored to have instructed Paddle Yoga on the show Total Divas. In partnership with Krama Yoga Cambodia and Journeys Within Our Community Jenay shared her passion for the practice with groups of adults and children. Jenay's classes are designated with a heart. Follow her blog on Visit Tahoe South's site. Read an interview on Shanti Green. Hannah Ouellette completed the 200 hour Raja Hatha Yoga Teacher training at Lake Tahoe Yoga in 2017. She enjoys teaching a variety of styles ranging from fast paced vinyasa to gentle, alignment-based asana. Hannah began practicing yoga through a personal desire for more mindful movement in her life and fell in love with the teachings, sounds, and breath work. Hannah's personal practice is a mix of Astanga, alignment-based, and Yin. Hannah enjoys using tools to make the postures more acessible to not only her practitioners, but also for herself. ​She believes that all bodies are yoga bodies and all asana are attainable for everyone. Shawna Rubottom completed her training at the Lake Tahoe Yoga School in 2016. Prior to practicing in the style of Rajahatha, Shawna enjoyed the Ashtanga Style. 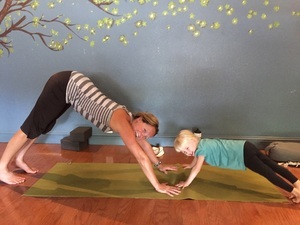 She incorporates movements from both practices into her classes. Her energy and enthusiasm will draw you into attempting postures of which you may have previously been fearful . When Shawna is not instructing Yoga, you can find out her out in the woods hiking or rock climbing. She also enjoys spending time with her dog.